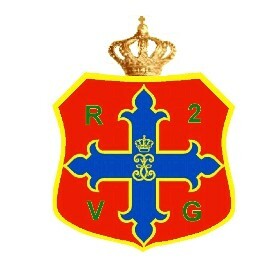 The 2nd Rifle Battalion (Venatori) was created on 11/23 February 1866 and has received its colours on 14 October 1874. 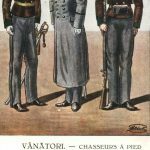 On July 1st (August 31st) 1860, Prince Alexandru Ioan Cuza created, by the Order nr.63, the 1st Rifle Battalion (Venatori), the first fighting unit of the modern Romanian army recorded as performing ceremonial duties in the Capital and guard duty at the Rulers’ Palace and, later, Ministry of War. The training of the troops was coordinated drectly by the General Headquarter. After the dethronment of Cuza, 3 additional identical Venatori battalions were created by the Ruling Counsel that had immediately taken over the reins of the country. 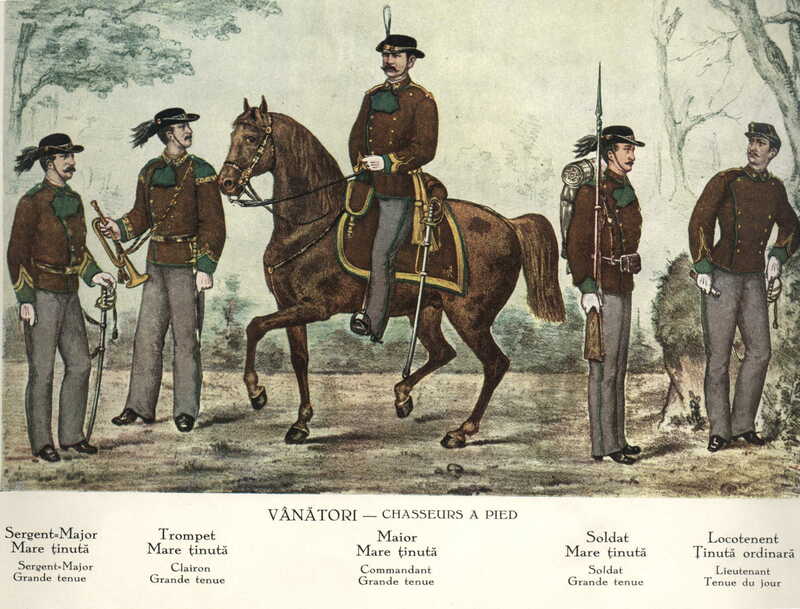 The 2nd Venatori Battalion inherited the traditions and ceremonial tasks of the initial 1st Venatori Battalion. Prince, later King, Carol I. kept using the 2nd Venatori Battalion, named „Queen Elisabeth”, for ceremonial duties and as Palace guards. This duties were temporarily assigned also to other units, such as 6th Dorobanti Regiment „Michael the Brave” or 4th Rosiori (Cavalry) Regiment „Queen Mary”. Some of the State guests for whom the 2nd Venatori Battalion „Queen Elisabeth” built the guard of honour were: Archduke Rudolf, King Oscar of Sweden and Norway, Duke of Nassau, Arhduke Karl-Ludwig, the Prince of Wales, the Prince of Wied, the Prince of Naples, Emperor Franz-Joseph, King Alexander 1st of Serbia, Prince Leopold, Prince Ferdinand of Bulgaria, Grand Duke Mihailovici of Russia. 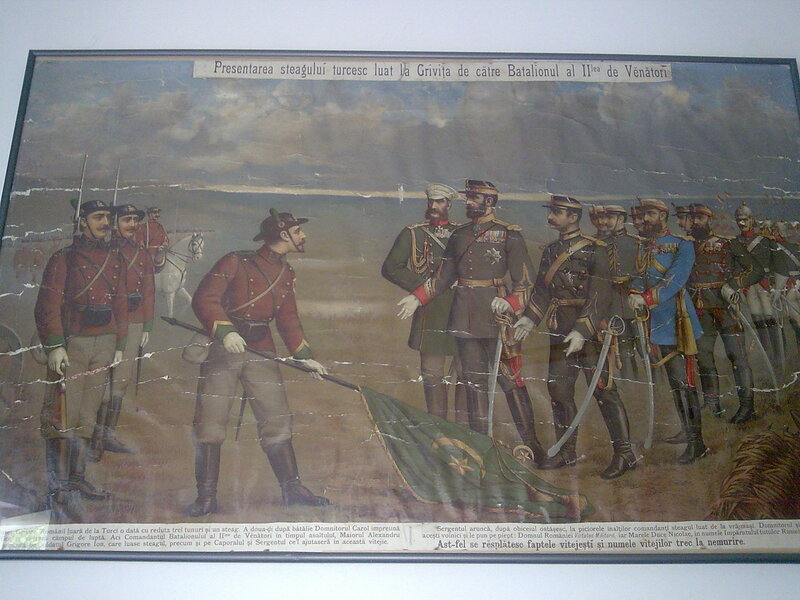 The 2nd Venatori Battalion „Queen Elisabeth” has brought a glorious contribution to the campaign across the Danube, during the War for the Independence of Romania 1877-1878. It has launched to assaults on the redoubt Grivita 1 on the same day, 30 AUG `77, led by Major Candiano-Popescu; 5 officers and 231 troops fell that day. 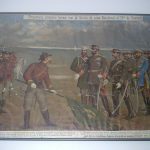 Eventually they took the redoubt Grivita and captured the Regimental flag of the defending Ottoman unit. King Carol II. created the Guard Regiments, status to which he promoted some of the most famous units of the Romanian Army (King’s Decree 1946 / 6 June 1931). 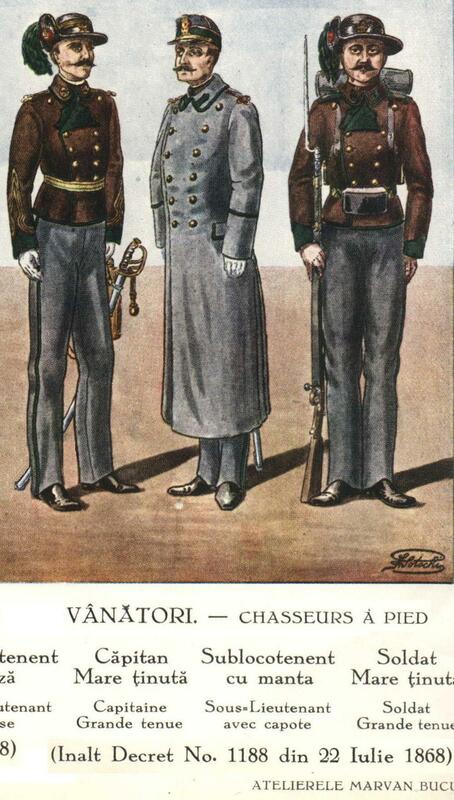 Guard units not only maintained their operational character, they had to be elite units, a model for the entire Romanian Army. However, they were also assigned by the Royal Military Household to ceremonial and Royal Domains and Palaces guard duties. One of the few Guard units was the 2nd Venatori Battalion „Queen Elisabeth”, that had a glorious path through all of Romania’s wars, till it’s disbandment by the communist regime in 1947. Greatcoat in gray cloth, double breasted, with two rows of 4 brass buttons each, turned off collar and cuffs. Dark green cloth collar patches and shoulder boards, piping of the same colour. On the shoulder boards were bearing the number of the regiment, in dark green cloth. Backpack made in black waterproof canvas linen, of rectangular shape, with black leather shoulder straps. Rank insignia were lace braid stripes, above the cuffs, made in yellow cotton (1 for “Fruntas”, 2 for “Caporal”) or gold lace (1 for “Sergent”, 2 for “Sergent-major”, 3 for “Sergent-adjutant”). It had 4 rectangular pocket flaps, 2 on the breast and 2 on the hips. The collar was rolled off, piped dark green, adorned with dark green pointed collar patches. Shoulder boards in grey cloth, piped dark green, adorned by the regimental number, in dark green cloth. 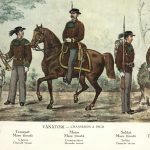 The rank insignia consisted of lace braid stripes, made in yellow cotton (1 large for “Fruntas”, 2 large for “Caporal”) or gold lace (1 large for “Sergent”, 1 large and 1 narrow for “Sergent-major”, 2 large for “Plutonier”, 2 large and 1 narrow for “Plutonier-major”, 3 large for “Plutonier-adjutant”), edged dark green, displayed on the shoulder boards of the tunic and greatcoat. The rank insignia consisted of lace braid stripes, made in yellow cotton (1 large for “Fruntas”, 2 large for “Caporal”) or gold lace (1 large for “Sergent”, 1 large and 1 narrow for “Sergent-major”, 2 large for “Plutonier”, 2 large and 1 narrow for “Plutonier-major”, 3 large for “Plutonier-adjutant”), edged blue (for infantry) and black (for artillery), displayed on the shoulder boards of the tunic and greatcoat.